There’s lot’s more, after the jump. .
[T]he US, an interventionist nation for much of the post-World War II period, has done things far more appalling than interfering in others’ elections – including regime changes by invading Iraq, Afghanistan, Libya and bombing countries in the name of the war on terror in the last two decades. Many Americans like to think that their interventions are justified. It is like when US politicians and TV commentators talk about foreign hacking into the US, they have forgotten that the massive cyber army in the National Security Agency is doing the same thing to other nations, only more aggressively, given the US’ technological edge. Or should we say Big Brothers. It’s not just elected governments that are intervening elections using powerful forms of intelligence gathering and covert ops. The documents also show that the Kochs have developed persuasion models – like their “Heroin Model” and “Heroin Treatment Model” – that target voters with tailored messaging on select issues, and partner with cable and satellite TV providers to play those tailored messages during “regular” television broadcasts. Over the last decade, big data and microtargeting have revolutionized political communications. And the Kochs, who are collectively worth $120 billion, now stand at the forefront of that revolution – investing billions in data aggregation, machine learning, software engineering, and Artificial Intelligence optimization. And whilst on the topic of election meddling, a familiar face has popped up in Brazil, where where Jair Bolsonaro, a virulent neofascist has just won the presidency. Bolsonaro is just the latest embodiment of the global rise of the radical right [see our earlier post]. 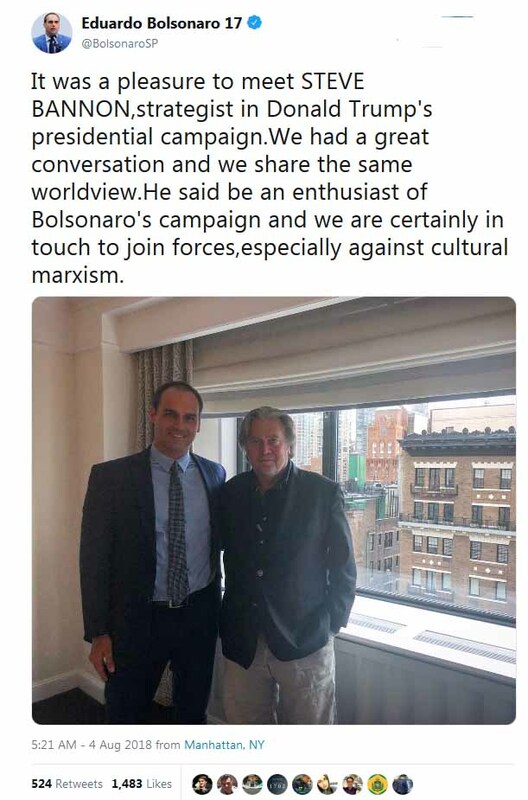 Bolsonaro, who is also known as the Brazilian Trump, is currently being advised by Steve Bannon in his campaign. Still in the hospital, after an assassination attempt a few weeks ago, the Brazilian populist combines promises of austerity measures with prophesies of violence. His campaign is a mix of racism, misogyny, and extreme law and order positions. He wants criminals to be summarily shot rather than face trial. He presents indigenous people as “parasites” and also advocates for discriminatory, eugenically devised forms of birth control. Bolsonaro has warned about the danger posed by refugees from Haiti, Africa, and the Middle East, calling them “the scum of humanity” and even argued that the army should take care of them. In these and other statements, Bolsonaro’s vocabulary recalls the rhetoric behind Nazi policies of persecution and victimization. But does sounding like a Nazi make him a Nazi? Insomuch as he believes in holding elections, he is not there yet. However, things could change quickly if he gains power. Recently, Bolsonaro argued that he would never accept defeat in the election and suggested that the army might agree with his view. This is a clear threat to democracy. This entry was posted in Africa, Crime, Cuba, Deep Politics, Europe, Geopolitics, Governance, History, Hypocrisy, Latin America, Politics, Secrecy, Spooks, Video. Bookmark the permalink.